Michael is a long-time resident of Acton, a community he has called home since 1964. He was elected to Council in 2015 following a by-election. Michael is an optimist who deals with issues and concerns in a sensible and realistic way. He attended M.Z. Bennett and Acton High School and obtained his degree in Media Arts at Sheridan College. Michael worked with the Upper Grand District School Board in Guelph for 36 years until his retirement as the Manager of Information Technology. Michael is a family man who cares about his children and grandchildren and their future. 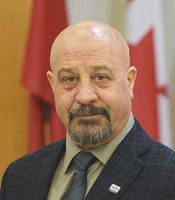 He is a past member of the Acton Lions Club, Baseball Coach, Big Brother Canada, Acton Fall Fair Knights of Columbus, Pan Am and ParaPan Am Games. He is a past recipient of an Award of Merit for outstanding contributions to education, given by the Ontario Secondary School Teachers Federation; the Wellington Country Board of Education’s Chairman Plus Award for improving teaching methods through the use of technology; and the Upper Grand District School Board’s Everyday Hero Award, for outstanding achievements in education.